Straight out of the overflowing imagination of the authors of the Jungle Speed and Bruno Faidutti (Citadel, Mystery at the Abbey, etc. 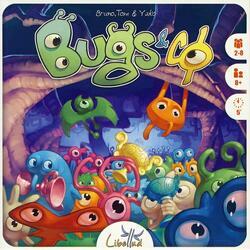 ), Bugs&co promises you wild games. Speed and memory will be put to the test in games where all players play at the same time! On the table are scattered "monster" tiles with hidden faces. The goal is to reconstitute as many families as possible of three identical monsters. But beware of similarities! At the start, each player, using only one hand, will have to turn over and collect as many "monster" tiles as possible one by one. Each tile collected is placed face down in the player's second hand. Be careful, once passed into the player's second hand, a tile can no longer be viewed or rested on the table. Mistakes will cost you dearly since each incomplete or erroneous family at the end of the game will give you negative points. Next to the monsters are placed "trophy" tiles, face up and in limited number. Each "trophy" tile earns additional victory points at the end of the game. A player may at any time take a "trophy" tile of the highest value still available and put it in his left hand. He then stops playing. When the last "trophy" tile is taken, all players who have a "trophy" tile in their possession, and have therefore stopped playing, start together, aloud, a ten-second countdown. At zero, the game is over and players who have not taken a trophy tile must also stop playing. Who in these crazy games will be able to do well, using speed, finesse and memory, to emerge victorious?